« The History Of The Bed: From Horse Hair To Now. How Have They Changed? The city of Boston, Massachusetts was founded in 1630 by Puritan colonists and grew quickly to become one of the largest cities in North America. Boston played a critical role in the American Revolution – just think about the Boston Tea Party for example! Boston is also home to one of the oldest universities in the US: Harvard University. The 19th century was really well known for building beautiful landscape-style parks. If you read the part about New York, you know people were craving fresh air and a little space to be at peace. Also, in the 19th century the thought took hold that parks could inspire citizens to be better people, and that city greenery could have a therapeutic value. A green environment was thought to be morally uplifting, and to inspire people to play sports or have polite debates, instead of drinking in bars and fighting. In this Boston map you can see a large park, right in the middle of the city, the Boston Common which still exists. In 1872, Boston suffered a great fire, one of the largest ones in American history. The houses affected are shown on this map. The map I’ve shown above was either drawn before the fire, ignored the fire damage, or houses were build back up very quickly. The houses in the affected area seem a little “flat” in drawing style but no major damage is visible in the map. Here you can see something very special and interesting: the start of city planning in a strict block pattern or gridiron layout. While in the New York and Boston maps, you still saw a more organic, irregular street pattern, in this map you see the entire city laid out in a block pattern. 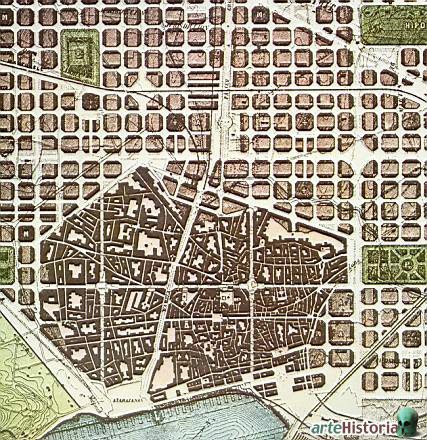 Generally, cities that were expected to grow big fast, were laid out in a block pattern. Cities that just organically grew bigger or cities with Medieval roots(for example, many European cities) will have a more organic, chaotic layout. My favorite grid pattern is Barcelona, where you really can see the difference between the organically grown city and the conscious city planning. In the US, a funny fact is that more cities on the west coast are laid out in a grid pattern. By then, cities were known to grow fast, to attract many immigrants, and there was a need for order and the prestige that came with neat long orderly streets. Cities on the east coast are more often laid out in an organic manner, having just grown from small settlements. And there you have it, my favorite maps! Do you love maps as well? Which city map is your favorite? Thank you to Teds Vintage Maps for sponsoring this blog! To see all of their incredible maps, go here: Ted’s Vintage Maps.